Autodesk 3ds Max 2016 Essentials is your perfect hands-on guide to start animating quickly. Using approachable, real-world exercises, you'll master the fundamentals of this leading animation software by following full-color screen shots step by step. Each chapter opens with a quick discussion of concepts and learning objectives, and then launches into hands-on tutorials that give you firsthand experience and a good start on preparing for the 3ds Max certification exam. You'll learn the basics of modeling, texturing, animating, and visual effects as you create a retro-style alarm clock, animate a thrown knife, model a chair, and more. Whether you're a complete beginner or migrating from another 3D application, this task-based book provides the solid grounding you need in Autodesk 3ds Max 2016. 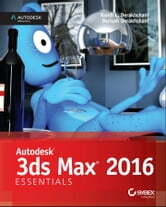 If you want to learn 3ds Max quickly and painlessly, Autodesk 3ds Max 2016 Essentials helps you start animating today.